A missing tooth can cause a number of problems, impacting more than just the aesthetics of your smile. When left untreated, the gap left behind by a missing tooth can increase the risk of gum disease, bone loss, malocclusion, and shifting facial bones. By replacing a missing tooth with a dental implant or bridge, form and function can be fully restored. Dental implants are designed to imitate the missing tooth’s root and crown for a durable, natural-looking restoration. A titanium post acts as the new tooth’s root, securing the customized crown in place for a comfortable, secure fit. Dental implants are frequently considered the gold standard for missing tooth replacement due to their unparalleled stability. Since a dental implant functions just like a normal tooth, no special care is required, and patients can clean their teeth with routine dental hygiene habits. 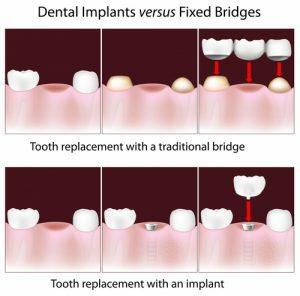 Bridges can also successfully replace a missing tooth and may be a better option for certain patients. For instance, some patients do not have adequate jawbone density to receive a dental implant and choose a bridge as an alternative. Others may choose a bridge because of a lower upfront cost. While dental implants and bridges can both be ideal solutions for the right candidates, our experienced dentist Dr. John D. Beckwith believes that dental implants are worth the initial investment when a patient qualifies. Not only can they last for decades—while bridges may need to be replaced—but dental implants can also preserve a patient’s facial bone structure, creating the most realistic tooth replacement possible.